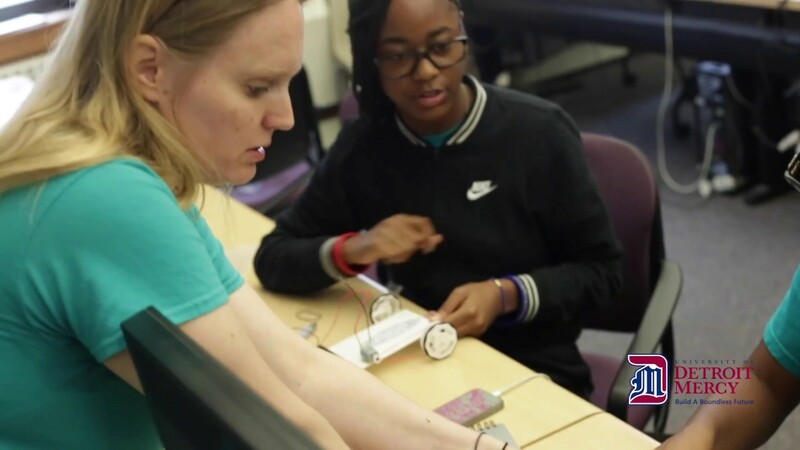 The partnership between Detroit Mercy Engineering and Ford STEAM inspires prospective female student engineers. Dr. Richard Hill, Assistant Dean for Research and External Initiatives, led the session using materials provided by the Ford STEAM organization. The lesson demonstrated the flow of electricity through a circuit creating a magnetic field to activate the motor of a car. The scholars were tasked with investigating the performance of their car based on the respective size of their drive axle pulley in comparison to each other. Once constructed, the students assessed the speed and gradeability of their vehicles. Thanks to Ford STEAM, the student participants also visited the Ford Product Development Center and received a deeper appreciation of what ideation, design and manufacturing processes are and how the topics they learn in the classroom are essential to the process of building cars. Ford STEAM is an educational initiative of Ford Motor Company that focuses on engaging youth in the fields of science, technology, engineering, arts, and math.